Gear, gear, gear. 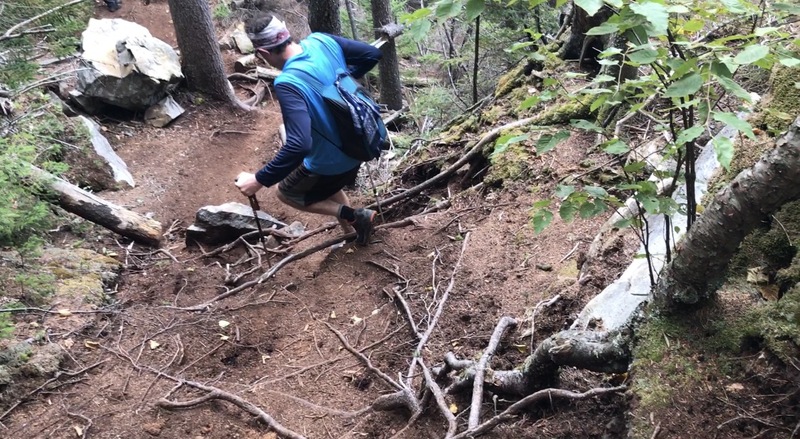 It’s easy to get bogged down in the minutia of gear stats when outfitting a long-distance hike. Weight, size, material, multi-use’ness, cost, it seems an unending process to choose what is best. Today’s list is 5 items that can be easily left out, but provide gear solutions to common backpacking problems. Most of these serve multiple purposes and they all are lightweight compared to their utility. The Sea to Summit day pack is made of Siliconized Cordura for strength and durability and holds 20 liters of supplies. At just 2.4 ounces, the pack is light and is self-contained, folding down to the size of a hackie sack. So, why would you want to carry a backpack within your main backpack. We used this pack primarily in two ways. First, we used it in towns where we were staying at a hostel or hotel. Instead of walking around town with our full (and smelly packs) we could leave the large packs in our room and walk around with the day pack. It was large enough to carry a couple water bottles, our wallets, phones, and rain gear. Hiking with a day pack gives you wings! The second way we used it was when we slack-packed. Slack packing is a strategy where you take only what you need for the day because you will be ending the day at the same hostel/hotel you left from (a shuttle will pick you up and bring you back). Slack packing is perfect for getting miles in when the weather is awful, or you are injured. The Sea to Summit pack was perfect for this. It was large enough to fit food, water, phones, and rain gear for both Chica and I. I would wear it and she got to hike backpack free … hey! Dealing with rain is a difficult topic, and the Appalachian Trail is a wet trail. Traditional rain pants and jacket might work with keeping the rain out, but they do a poor job of keeping you dry … because you sweat. Pit zips help for the jacket but achieving that happy point of being dry but not hot is a challenge. Enter the umbrella. Weighing about a half a pound and being shaped the way it is, an umbrella is not an automatic or easy choice to make. However, if it replaces a 1 pound jacket and pair of rain pants, it could be a winner for you. I wore a rain jacket and ULA’s rain skirt. The rain skirt was great because it allowed airflow. The jacket was miserable. Chica, on the other hand used a combo of rain jacket and umbrella: using both when it was cold out, and the umbrella only, when it was warm out. This combo worked great for her. I’ll just say this, every single time the umbrella came out I thought to myself, damn, I wish I had that. Jen had the EuroSCHIRM Swing Liteflex umbrella and figured out how to set it up hands free using her chest strap and belt (see video below). In addition to the type she used, we ran into a fellow at the Yellow Deli who had an umbrella that was made hands free since it attached to his head and had a chin strap. He said it was his favorite piece of gear. We’ll be trying the chin-strap version when we hike the Camino de Santiago in Spain later this year. We’ll let you know how it works out. They say you pack your fears, and well I guess we packed ours. We were paranoid about getting the gear inside our pack wet. Particularly our down-filled items (puffy and sleeping bag). So, in addition to our packs already being water resistant, we utilized a pack cover, drybags inside the pack and lined the pack with a trash compacter bag. We never experienced wet gear, so all of our preparations worked. We could have probably left the pack cover and drybags at home and just used the compactor bag. Although the dry bags did help with organizing our gear within the pack. You can use a compactor bag or a contractor bag (they are two different products). The compactor bags come in smaller sizes and work better, in my opinion, than the contractor counterpart. Also, and this is important, the compactor bags come in white. This color helps the hiker see the gear in the pack as it is contrasted against the white background of the bag. Duct tape is an all-around excellent accessory to have and can assist the long-distant hiker in many ways. In addition to being utilitarian the product is inexpensive, waterproof, and durable. 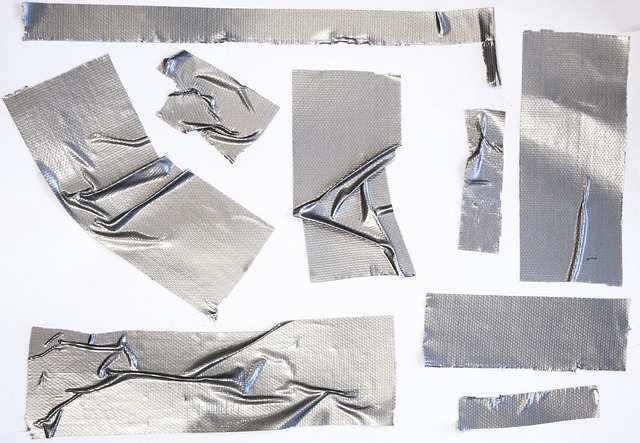 Whether it’s a blister or a hole in your rain-fly, duct tape can be placed over the offending wound until proper repair can be made (or not). My Ghost Whisperer puffy jacket is still adorned with multiple strips of the gray stuff from run-ins with thorn bushes and trees. Duct tape is also useful for organizing your gear. Slap a piece on and label it with instructions or a name or anything else that might help you identify and use your gear. Buy some reflective duct tape and put some on your bear bag. Not only will this identify YOUR Zpacks bear-bag among the throng, but when you hear that creepy sound in the middle of the night, the one that sounds as if a bear just stole a bear bag, you can shine your light towards yours and be at ease when it twinkles back at you. I am sure there are many other uses, but needless to say it is worth carrying some. While some hikers wrap it around their hiking poles I would warn against this. Because, when the tape has been on your poles for 1,000 miles, in all sorts of weather, it will fail when you need it most. Just ask me. It was a rainy night when I needed my duct tape. It was dark, and the wind had just catapulted a huge branch onto our tent. A tentpole snapped. A hurried search for a repair sleeve ended with none. Duct tape to the rescue! As soon as I started peeling the roll I had carefully placed around my pole 3-months prior, I knew I was in trouble. The adhesive came off, rendering the tape useless. Luckily Chica had some inside her pack, wrapped around an old pen (the other side had leukotape on it). So wrap the stuff where it will be protected. Better yet, get a slim roll and keep it in the bottom of your pack. 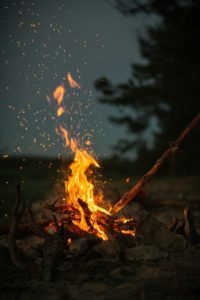 Most hikers enjoy a fire at night … hiker television as it’s called. But most thru-hikers are tired at the end of a hard day and spending half an hour starting a fire is not palatable. Still, on a cold wet day, a fire might save your life and getting one started, especially in damp conditions, can be challenging. Enter the cotton ball fire starter. A cotton ball itself will ignite quickly and burn out just as fast. However, if you add Vaseline to it the cotton will catch but the Vaseline will keep it from burning up. Light it up with a ferro rod or lighter and a saturated cotton ball can burn for up to 4 minutes and makes a great replacement for tinder. Vaseline is not flamible, instead it acts like the wax in a candle and the cotton as a wick. Also, petroleum jelly is waterproof and will protect the inside of the cotton from getting wet. The two components are cheap and easily found at any store. So, make yourself up a few balls and put them in a Ziplock for an emergency or when you are hiking and want to watch a little TV. See this informative post for more on Cotton Ball Fire Starters. Cool post! Thanks for the advice. My hubby and I are heading out for a section hike and I was just about to roll my Leukotape and Duck tape around my trekking poles. But as section hikers, they may likely be rolled on there for a very long time. I’m not going to do it now. Perfect timing. Glad we could help 🙂 Enjoy your section hike! I can’t wait to try the cotton balls and petroleum jelly. Looking to do my first solo backpacking trip, building a fire is always my bf’s job. Hoping this takes the pressure off me. Thanks!